"What is key to a great music website? An engaging, easy to scan, music page, with lots of songs to listen to. It should reflect who you are as a musician, and offer lots of options for your listeners in an organized way. Remember, people are visiting your website to hear your music - so make it easy to listen to! You've set up your perfect Homepage now, and added a great band bio page - time to tackle the music page to start selling music online! Make sure you have music on this page that’s easy to listen to. Add a track list, an album, or some singles and make it clear how to press play and listen, right away. While you should have your full discography available to sell online, you don’t have to stream your entire catalogue. You can pick some songs to play in full, or set up preview clips. Offering a few free digital downloads is a great way to build your fanbase. Often, someone will download a song just because it’s free. Then they’ll listen to it and come back for more once they know they like it. Even better, offer a few tracks in exchange for an email address. An email address is the most effective way to keep in contact with your fans to sell your music, and is well worth exchanging a song for! +To Sell or Not to Sell? With digital downloads and streaming, gone are the album/CD jackets with lyrics, but many fans still want to find the lyrics somewhere. So on your Music page, be sure to also include lyrics for your songs (this can be easily done within our "Album" feature). Another option is to create a "Lyrics" submenu page for your Music section and post all of your lyrics there. Just make sure that fans can find them on your website! Front and center on any music page should be digital downloads. With our no-commission music store, you keep 100% of the sales. So that’s more money in your pocket than if you sell through iTunes. You've got lots of options to offer your music for digital sale. You can add full albums, a track list of assorted singles, mixtapes, and more. You can offer music in MP3, WAV or FLAC format depending on who you are selling to. You can also set a fixed price on your tracks or album, or allow fans to pay what they want. To sell even more music online, hype your upcoming release by using our pre-order option for your fans to buy music early. In addition to digital downloads, be sure to include some physical options to ship out. Some people still love to have something to hold in their hands, and to pop into the CD player. You can also add limited edition items, like signed CDs or vinyl, and track inventory automatically in your store. It's tempting to put every single track you have ever recorded on your Music page. If you do this, though, it scatters the focus of your music fan and potential customer. Then use columns underneath to lay out the rest of your content. You could add a full width column with some text about your music. Then 2 even columns side by side with 2 older albums, and so on down the page. Or, do differently sized columns, with music players to the left, and content in a smaller sidebar column on the right. Mix it up a bit to keep it interesting! One great thing about your own website is that it’s all yours! You control the content, and you can add more information to make your music page personal. This really appeals to fans and can convert them from listeners into super fans. So rather than only placing an album with description and artwork on the page, write out a bit more about that album. Talk about your style, and how and when the album was made. Include anecdotes and images that are on point and professional. This will make your music page more appealing, and add context for your fans. It works well to sell music directly through your store, but you may want to include additional options that some of your fans will be comfortable with. You can connect your bandcamp store in seconds, or embed code from other music stores, like iTunes. Have fun setting up your Music page! Think of it as a one stop shop to learn all about you and your music. Make it sound great, offer music that’s easy to listen to and download. Then organize it an a visually appealing way, and you’ll be all set to sell more music online! 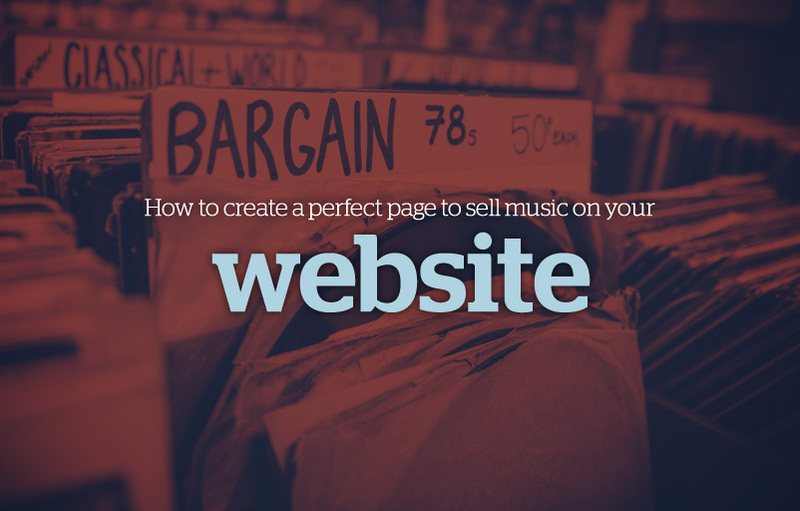 Build your own website with a music page and sell more music online! Sign up free with Bandzoogle now."